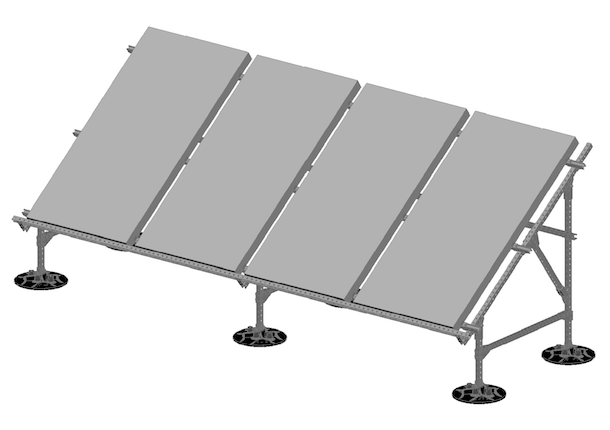 The PHP Solar Mounting System is designed to support a wide variety of rooftop solar and photovoltaic panels. The system can be used on virtually any industrial or commercial building with a flat roof or low slope roof. Supports for high and low profile installations are available. Layout isolation pads (provided by contractor) according to the design and layout. Insert legs of substructure frames into bases. Space out substructures according to the instructions. Attach horizontal and diagonal bracing to the substructures at designated locations. Make sure support panels are leveled vertically and horizontally. Check that the weight of panels is distributed evenly throughout the system.